The new electric car charging points at Fremantle’s Cappuccino Strip car park are now live. The four 22 kilowatt charging points are compatible with most electric vehicles, with a one hour charge giving between 18-40 kilometres of driving distance depending on the car. There are also two standard 240 volt charging points, which means all current electric cars can be charged up using the appropriate cables. The chair of the WA branch of the Australian Electric Vehicles Association Richard Baird said the new charging points would be greatly appreciated by the owners of electric cars. 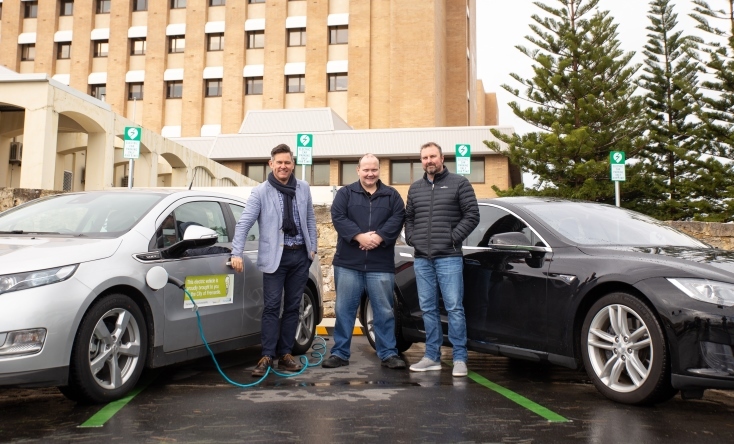 “Fremantle has always supported electric vehicles and it’s fantastic that they’ve allocated four electric vehicle charging bays for the Cappuccino Strip and all EVs are welcome,” Mr Baird said. “Around Perth there are probably about 50 or 60 of these charging points but that’s growing all the time, and as more electric vehicles are sold onto the market we’ll see more charging stations go in. While the drivers of electric cars will still have to pay for parking, charging their cars will be free. Mayor Brad Pettitt said the new charging points meant the City of Fremantle was continuing to be a leader in sustainable transport. “We had free car charging at the Queensgate car park as well, and now that this new car park has opened it was really important that we expanded the service,” Mayor Pettitt said. “It’s all about sustainable transport and offering that mix. Our One Planet Strategy is focussed on either getting people out of cars, or if you’re going to be in a car then we’d like you to come down in an electric car. The City of Fremantle’s One Planet Strategy includes a commitment to encourage and enable the community to reduce carbon emissions from transport by at least 30 per cent by 2020. The charging stations are just one of the environmentally friendly features of the new Cappuccino Strip car park, which was built using recycled road materials and also features solar lighting, storm water capture and water-wise native plants. For more information about the City of Fremantle’s One Planet Strategy visit the One Planet page.